I have always been fascinated by the campaign in the Western Desert : as a boy I traveled the length of the North African coast with my family, and the experience made a big impression. The heat , the dust , the infinite horizon ... and the flies. At that time there was still visible detritus everywhere, rusting silently as testament to the campaign , and it all somehow captured my imagination. So I have quite a few figures in my collection..
Minefields were a major factor in the desert war : miliions were laid by both sides , to deny or control movement; and the Engineers, having not many bridges to worry about , spent most of their time laying or clearing them. Until the arrival of the Polish mine detector in late '42, clearing them had to be done by hand , using hands and a bayonet, a nerve-racking procedure . Rajiv 1940 :4/6th Rajputana Rifles . 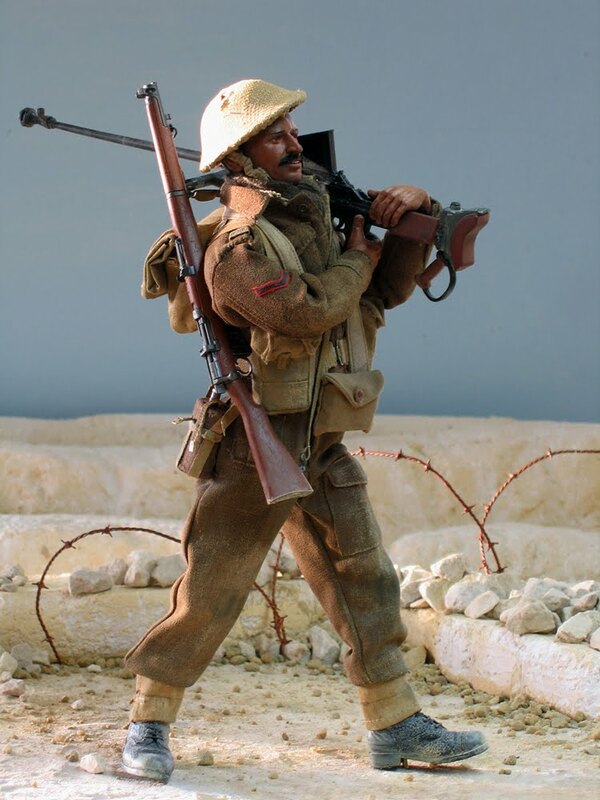 The Indian Army scarcely features in most common perceptions of the British War effort in WW2…. 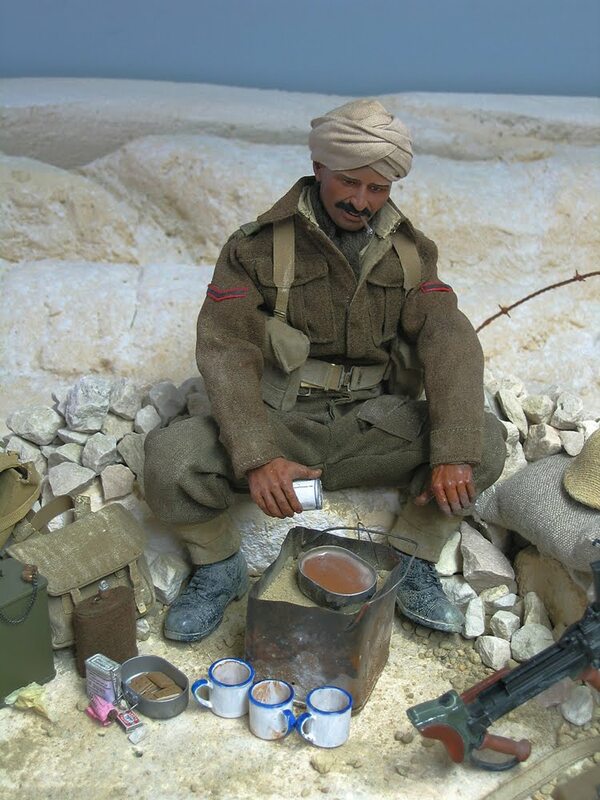 one could be forgiven for thinking that as far as modelmakers are concerned , all British campaigns were fought entirely using British troops ( with a few Gurkhas thrown in because everyone’s heard of them ). Because of its Imperial history , the British Government still just had had control of India , though already engaged in the politically complex and sometimes tragic process of negotiating its Independence . The Indian Army had served the King-Emperor in WW1 , and when the call came in 1939 immediate use was made of this huge reserve of manpower. The 4th Indian Division was the first to be sent out , and served at the forefront of the campaigns in N.Africa , with two short but very hard campaigns in Eritrea & Syria , back to N.Africa , then on to Italy. As with all Indian Divisions, it had three Infantry brigades , each brigade containing one British battalion and three or more Indian battalions . 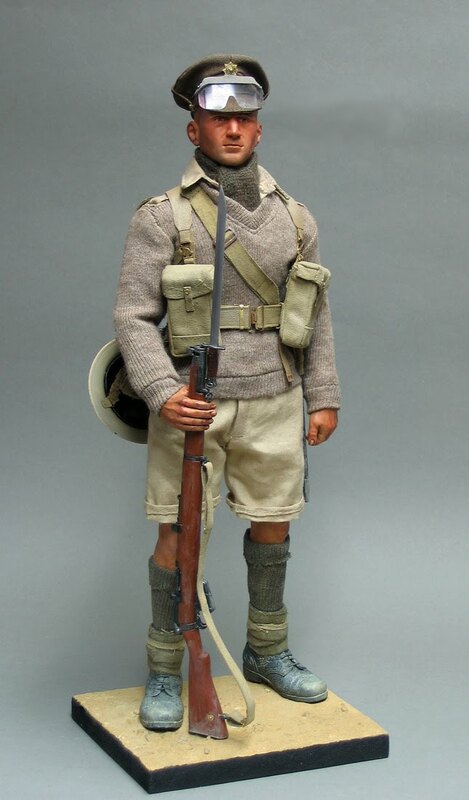 One of its most distinguished battalions was the 4/ 6th ( Outram’s ) Rajputana Rifles , from which my figure comes. This regiment was recruited in what is now Rajastan , from Hindu and Muslim volunteers . He’s a Lance-Naik , carrying the Boys anti-tank rifle issued to each platoon HQ. This weapon had a performance much the same as other anti-tank rifles at the time , 20mm of armour at 500 metres in ideal conditions : useful against light tanks ( particularly the Italian ones: it would go straight through their ridiculous tankettes ), but by 1941 largely useless against the DAK Panzers. The model is the rather rare 21st century one : very good , once you scraped off the mould lines. The small pouch hanging down his front contains ammo clips for the Boys. It was the only hand-held anti-tank weapon available , however , so the troops had to use it in tight corners. Normally carried on a truck or Carrier , it was a heavy and inconvenient thing to carry at 36 lbs , and normally operated by two men . He's using the Benghazi cooker , an improvised object made from a cut-down petrol tin filled with sand. Pour petrol on and ignite, and it will brew tea in a few minutes.The tea would be made very strong and very sweet , full of condensed milk.... and tasting of petrol. Captain , 5th Batt. Cameron Highlanders , Tunisia , March 1943. 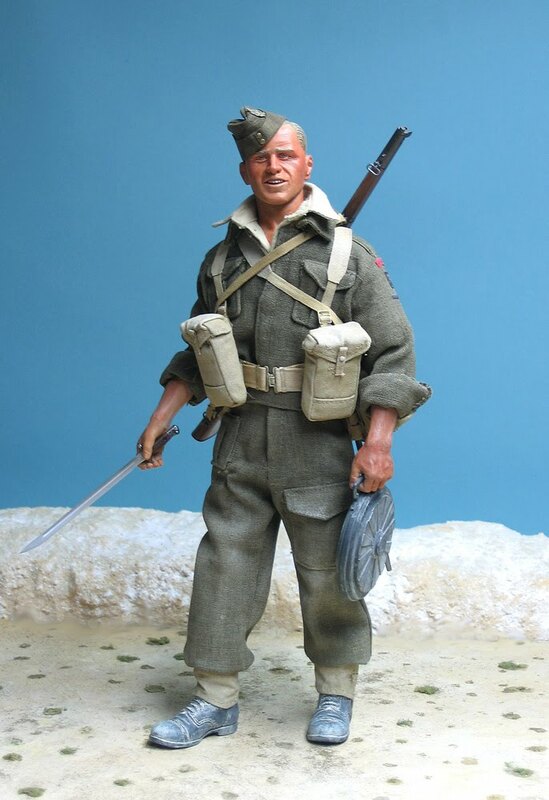 A very straightforward figure of an Infantry officer of the famous 51st Highland Division, based on a Mike Chappell plate , itself based on a photograph . The 51st served in the 8th Army for a long period , and after the Axis retreat westward after the victory at Alamein , were part of the pursuit from the east into Tunisia . The Axis forces stood to fight on the old French Mareth Line, which was fronted by the Wadi Zigzaou , where this Battalion distinguished themselves , being granted a Battle honour for the engagement. The 5th battalion were Territorials , so I thought he might be a fairly mature man . 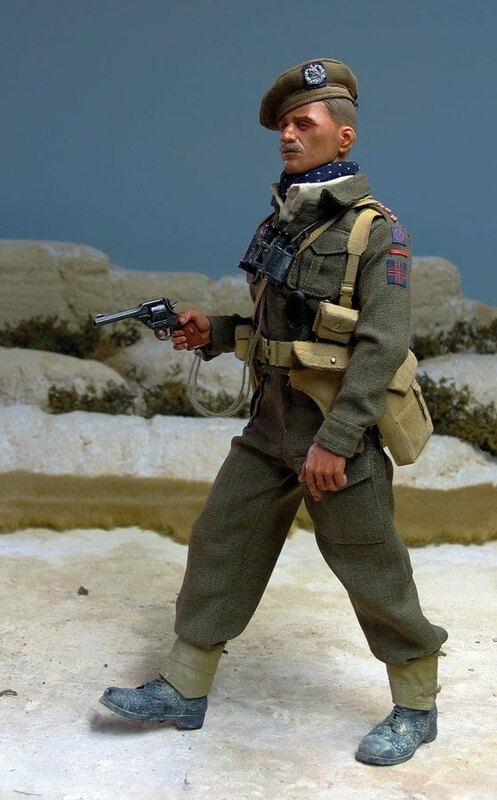 The rig is entirely conventional, being the Officers' pattern webbing set .He has aWebley Mk.VI of Great War vintage : still serviceable , and a very powerful pistol.